Edgar Fernando García was only one of almost 40,000 civilians forcibly disappeared by the Guatemalan state during the internal conflict, however his case has become emblematic in Guatemala’s process of historic memory and the eradication of impunity. Recently declassified archives have brought to light important details that have resulted in an attempt to bring García’s perpetrators to justice. As a student and trade union activist, Fernando García was specifically targeted by Guatemalan military forces who worked in conjunction with the CIA. He was an advisor to the Labor Orientation School at the University of San Carlos, the secretary of the glass worker’s union, and a member of the Association of University Students, a group that actively protested oppressive governmental acts. 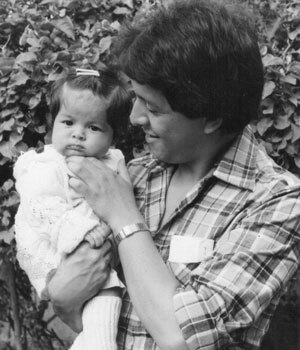 On February 18, 1984, he was kidnapped near his home in Guatemala City and never seen again. The government denied any involvement in his disappearance. García’s wife, Nineth Montenegro, in response to the indifference of the government and their refusal to provide facts, founded the Mutual Support Group (GAM). The relatives of missing Guatemalans continued to press for information and truth regarding their loved ones. Twenty five years later, the bilateral collaboration of the National Security Archive in the US and the National Police Archives in Guatemala resulted in the obtainment and release of key documents from both countries regarding the cases of numerous victims, including Fernando García. It was revealed that García’s abduction was a political act organized by top government officials, who saw him as a communist threat. It also became apparent that the US was well informed of these actions. The names of those involved were found in these documents as well. On October 18, 2010, the trial of Hector Ramirez Rios and Abrahan Lancero Gomez, two former officers of the National Police, began. They are accused of the forced disappearance and murder of Fernando Garía on February 18, 1984, charges with a maximum sentence of 62 years. Congresswoman Nineth Montenegro, wife of Fernando Garcia, gave her statement in which she entailed the suffering she and her daughter have undergone, and her demand for justice. Alejandra García, daughter of Fernando García, as well as the Public Prosecutor’s Office, have affirmed that they have over 550 documents from the archives of the National Police. This is the first case in Guatemala to be based on documents in the Guatemalan Police Archives. Kate Doyle has also stated that there are documents in the CIA archives that record the capture of a union leader on the day of Fernando’s disappearance. US Ambassador McFarland attended the hearing and expressed his support that the case be brought to light. Two days later, six expert opinions and seven witnesses were brought to court on Oct. 19, including Danilo Chinchilla, Garcia’s companion who was also kidnapped, and Rember Larios, former director of the National Civil Police. Lagos confirmed the existence of civil defense patrols and social cleansing operations coordinated by the central office of the National Police. Both defendants were convicted and sentenced to 40 years in prison on October 28, 2010. Those prosecuting the case continue to seek prosecution of the intellectual authors of the crime.